We are into single figures! We are now only 9 weeks away from our due date. Baby spent week 30 in sunnier climates while the wife took our little bump to Gran Canaria. (If we consider Goa as his/her first holiday which is when we found out, then he/she has been on more holidays than me since then!). I am much happier now they are home with me safe and sound. I had visions of Christine going into labour on a sunbed and me missing the whole thing, which after the amount of years I have waited for it, would have been devastating! 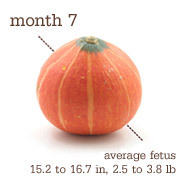 At week 31 and I think for the last time on our journey, we are still the size of a squash! Not long now and I know we are ready, well as ready as anybody could ever be! When Christine, came back she told me about a Drag show/cabaret night that her and the girls went to. Part of the night involved standing to have you photo taken with a couple of the performers. What do you think the first thing I noticed on this photo? The butch (fe)males that bookend the group? No. The first thing I noticed was how most of the girls had there hand by their sides, but Christine had her hand firmly on her bump. When I asked her why, she simply said. I don’t know. You gotta love maternal instinct! PS. If you are into playing the stock market, now is the time to invest in Gaviscon. Christine’s started getting heartburn/indigestion, so no doubt the shareholders of said company will be buying a new yacht next year! PPS. If you could be so kind as to ‘Like’ my page on facebook, clicky link can be found on the right hand side of this page. Thankyou!